A winter skirt, just in time for spring. This lovely wool was given to me years ago and I finally felt confident enough to sew something with it. 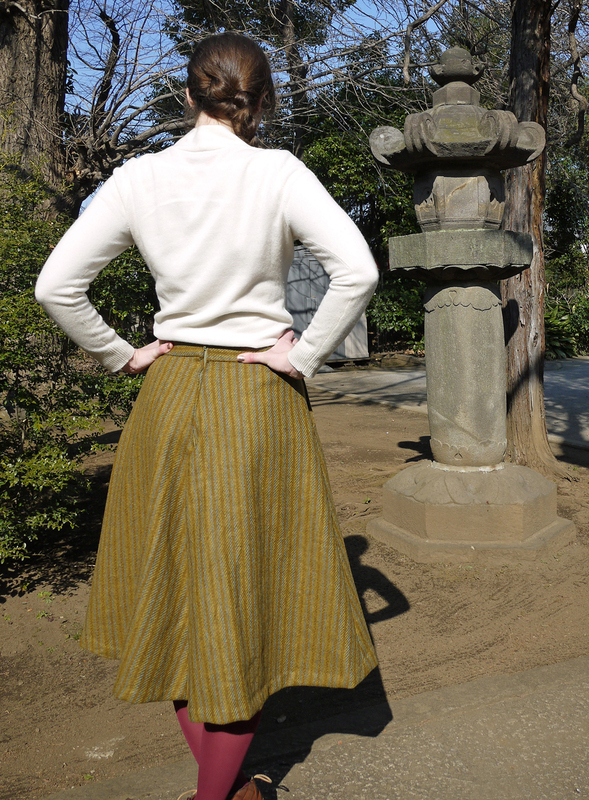 I used the new Sewaholic Hollyburn skirt pattern, which is designed for hippy ladies such as myself. A nice match, I think. It reminds me a little of a skirt my mom used to have. Or the one Vera Ellen wears around the fire in White Christmas. You know the one. I have a teeny confession to make, however. The hem is only basted. I don’t own a full length mirror, I usually reply on shop windows as I walk to the subway station. The barber is used to me adjusting my pants in front of his window, and we are both OK with that. I’m not yet sold on this skirt’s length (I added 2 inches to view A) and wanted help from these photos. So don’t look too closely. I completed this skirt as part of a Hollyburn sew-along. The pattern was easy to understand, but because it is wool I thought it was necessary to add a lining and it turns out I needed a little hand-holding. Thankfully Rachel at My Messings did a step-by-step guide. This was my first garment with a zipper and a lining so there is definitely room for improvement, but I’m happy with they way it turned out. Well, after it is hemmed, maybe in time for next autumn. 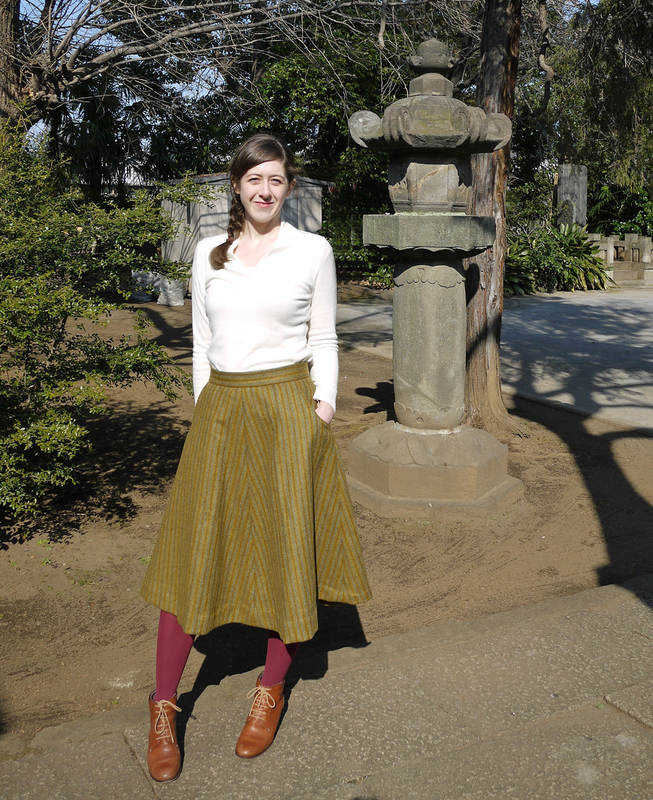 This entry was posted in Sewing and tagged Hollyburn, Japan, sew-along, Sewaholic, sewing, skirt pattern, Tokyo, wool skirt. Bookmark the permalink. Good job! Length looks good to me. Really? Now, how to hem without the obvious hem line? You look ten feet tall in this outfit. Supermodel girl! Lovely! Great with the tights too. Lovely skirt! I love the fabric. If you need help leveling the hem alone, chalk up a string, suspend it in a doorway at the desired hem length, then stand against it and rotate to mark the skirt. Thanks for visiting my blog! beautiful (you and the skirt)! Great work! This looks like a deliciously warm skirt! cute! And tell us about those shoes! 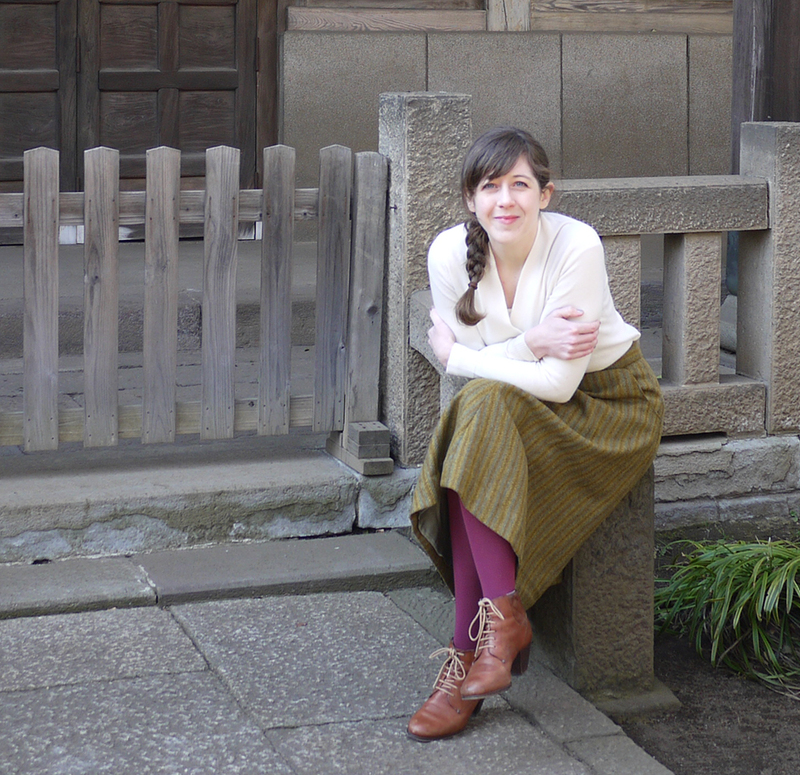 I really love learning about Japan through your view & your writing is just right.